It’s good to be back. Welcome to the 2018-19 NHL season. Before we get to the notes and thoughts, let’s take a quick look at everyone’s favourite topic at the moment – William Nylander’s contract. Both parties have an appetite for a long-term deal. For the Leafs, their goal is a cap-controlled number that helps them fit all of Nylander, Mitch Marner, and Auston Matthews under the ceiling for the foreseeable future. For Nylander, he would get the security and a big payday that anyone in his position would want. Coming off back-to-back 61 point seasons, it would be fair to argue Nylander falls in this range. The sticking point is his ceiling is much higher than that and any deal in that range will surely be a bargain in a few years, particularly if he takes a leap – as many are hoping – closer to the mid-70 point range. Together with Matthews, they make a lethal duo capable of controlling ~55% of shot attempts against top matchups and defense pairings. While you could argue you can find anyone to play with a talent like Matthews, the fear is having to cycle through mediocre options the way Pittsburgh has with Sidney Crosby and Edmonton has begun to with Connor McDavid. One preseason without Nylander and Matthews has free agent signing Tyler Ennis on his wing the whole time. He was bought out by Minnesota this summer and is just trying to prove he still belongs in the league. Nylander will bank on that and his upside. The contracts the Sabres gave Jack Eichel and the Oilers gave Leon Draisaitl did nobody with good young players any favours. Both those deals project big time and the guess is GMs will have to be responding to those comparisons for years. That pushes Nylander to reportedly ask for $8 million or so. If he gets to that ~75 point range as soon as next season at say, a $6.5 million cap hit, he’s already underpaid. And that’s the fear from his side. New GM Kyle Dubas has played this right so far. He has all the leverage and he needs to be ruthless in these types of negotiations in order to sustain this roster as best as he can over the coming years. Nylander starts losing money today and every day from this point forward. While the team is undoubtedly worse without him, it’s not the end of the world and it’s hard to imagine they start losing games at a rate that flips the tables. It’s more likely that Nylander will have to cave here. A bridge deal might then come into play; if they really can’t agree on the annual average, they might need to take one and revisit this when Nylander has a longer track record to his name. A bridge deal would be a loss for the Leafs. It would almost certainly become problematic for the team to have to pay him big money two or three years from now after Marner and Matthews are locked in. It would be difficult to imagine the team fitting in all three players plus the Tavares deal at that time. At this point, what happens next is anyone’s guess. The only thing we know for sure is the clock is really ticking now because Nylander is losing money by the minute. – Tough to take anything in preseason seriously when it comes to veterans. They really just want to shake the rust off and avoid injury (he’s not a vet per se, but the Seth Jones injury was sad to see). They also generally look better than young kids and AHL players with little shot of becoming full-time NHLers (see Ennis, Tyler). The Leafs also never had their true line up in, but in the last two full roster games vs. Montreal and Detroit, they were relatively even with both teams at 5v5 and got by because their power play was so great. They were not a great possession team last year and it’s something they need to work on – this will be something to monitor throughout the season. Are they controlling play and attacking teams in waves, or are they content to trade chances and wait for power plays? They have the talent to get away with the latter, but they need to play like the former if they want to get where they want to by the end of the year. – It will be interesting to see who ends up quarterbacking the top power-play unit – Rielly is getting the first crack, but I actually tend to think Gardiner is better for it. He has a better slap shot and walks the line really well with a good ability to pull in defenders and dish it off. Teams tend to sag off Rielly and dare him to shoot (though to his credit he has improved his shot a lot the last few years). Although a pessimist would say if you play Gardiner on the top PP unit, it will only make him more money next summer. – The backup goalies will be largely debated because there isn’t much else to debate, to be honest. The options were a proven backup, an inexperienced kid who hasn’t shown anything in the NHL (which may or may not be his fault because of the team in front of him, depending on who you ask), and a young goalie that has been steady in the NHL (.913 save percentage in 87 games). There are so many ways to look at this one, but the least controversial seems to be picking Sparks because he was AHL goalie of the year on a stacked team. But being a starter is one thing, whereas playing two games each month in the NHL and having the pressure to perform well in them is another. McElhinney was the comfortable option because he’s proven himself in the role, and Babcock is very adamant on who his starter is and the workload he’ll be getting. I think the diamond here might have been Pickard in terms of a future steady backup at age 26 with steady NHL numbers, a good appearance for Canada in the World Championships a few years back, and strong play on the Marlies. They only played him for 40 minutes in the preseason so either he did something off the ice that was unforgivable or they were trying to make teams forget about him and sneak him through. – Two players that I thought had strong preseasons last year that were slightly disappointing this time around – Justin Holl and Carl Grundstrom. Holl gets by on savvy and keeping the game simple, but he got caught more than a few times over handling the puck or giving it away in danger zones of the ice. His game is best when he stays within his limits and makes easy reads. He had one play in particular where he went back against the Habs in the 5-1 loss and head-faked an oncoming forechecker to evade pressure then threw it right up without making a proper read for a giveaway. He’s much better than what he showed. For Grundstrom, what separated him last season (in my view) is he brings a different element to the team — going to the dirty areas, the way he battles and gets his body involved. This is a skilled team, so when you mix in a few players like that, they naturally stand out. In the playoffs for the Marlies, he scored eight goals in 20 games (and 14 points overall) while mucking it up. That game was really not on display this preseason and Babcock gave him power play time to boot. – I was also not impressed with Josh Leivo’s game this preseason – someone who I vouched for a lot the last two seasons. He wasn’t involved, he wasn’t creating, and in the game in Montreal in which he played almost 14 minutes, he didn’t have one play of consequence. To his credit, in his last preseason game, he had three points and could have had as many as six if the finishing was better. He’ll have to play a lot better in the regular season to keep a spot. Also – on the Marleau goal where Leivo shot it wide – I am wondering if that was on purpose as it seems unlikely he’d shoot along the ice in the slot and also shoot wide. If so, great play. Babcock’s Red Wings teams used to do that a lot. – Player that surprised me with a better-than-expected camp: Rasmus Sandin. He was poised with the puck, transitioned it well, held the blue line in the offensive zone well, and looked comfortable in general. I don’t think the Leafs planned on him starting with the Marlies, but he really earned that look. – I wondered when the Leafs signed Tavares if we’d start to see stars on the penalty kill. The early indications are yes. Without Komarov, Tavares was taking faceoffs and quick to get off if he won them. Marner took a regular penalty-killing shift. There are mainstays in Zach Hyman and Connor Brown, of course, while Kasperi Kapanen appears entrenched in a penalty kill role as well (and that is a good thing with his speed). The Leafs also essentially require their 4C to play on the penalty kill – which is why I think Gauthier made the team. They don’t seem sure about Lindholm in that part of the game just yet. – Can’t recall Frederik Gauthier playing much left wing previously, but the last game he appeared in preseason that was his position, and he played just under 10 minutes with a minute of penalty killing time. He had 18 points in 57 AHL regular season games last season and eight points in 20 playoff games, so there is not a ton to suggest he’ll be a productive NHLer at this point, but if you’re going to have a regular healthy scratch, it would make more sense to have this type of player in that role than a player with more upside who needs minutes to develop. – There was a shift in preseason where Babcock put Kadri – Tavares – Marner together and they were dominant. That might be a nice little power unit for the Leafs to keep an eye on. I went back and watched some tape to get a feel for this, and this is what I’ll say about Zaitsev being their best defender at shutting the cycle down – the competition is slim. Nobody would argue that’s Gardiner’s game and while Rielly will engage, he’ll also go for a quick stick check because he knows the reward of being able to transition the puck up ice (because he can). Hainsey had basically no legs after Christmas and the rest of the defense was just a sheltered, mix bag. To Zaitsev’s credit, he was trying to use the middle of the ice more in preseason (to mixed results, there were some giveaways on a platter), but his ability to transition the puck cleanly, tape-to-tape, is just not there right now. I think we’ll be hearing this type of quote quite often this season – they are talented enough to get away with it, but you don’t want this team to just wait for power plays instead of dominating at 5v5. That’s what they should have been – and were not – doing. Even though this team is a legitimate Cup contender, the new GM and Leafs Nation are still really getting to know each other. Under Lamoriello, the team traded high draft picks each season for fourth line centers. With the current roster, it’s tough to imagine them not looking for defensemen all year, and they are at a point in their development where they can definitely justify trading a young forward for one. We’ll see how Dubas handles that situation as well as the impending Jake Gardiner free agency, the ongoing Nylander contract saga, the goaltending situation, moving the young talent they already have on defense through to the NHL team, and more. 1) I have no scoop on this, but my gut says a long-term deal will get done with William Nylander. The Leafs are trying to avoid a bridge deal because it will hurt their ability to keep Nylander in the future and/or mess up their cap. Nylander will have little leverage because the team is relatively fine without him (at least to start the season), and he’s losing money by the day now. I think it gets done. 2) The easiest prediction here: I think the Tavares line will be the real top line. 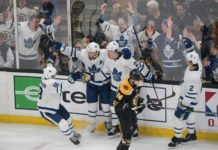 Babcock will trust them in more situations, the Tavares – Marner chemistry already looks instant, Tavares is a horse in his prime, and once Hyman returns, it’s hard to see that line not checking all the Babcock boxes. They’ll play lip service to the lines (“whoever is going each night plays!”), but this is going to be the go-to line at the end of the day. 3) I doubt the Leafs trade Jake Gardiner during the season and when it is all said and done (barring something like another complete playoff meltdown), my guess is the Leafs lock him up to a new deal. Babcock likes him, Dubas likes him, he’s productive and can eat minutes, and it’s hard to improve your defense by losing a top-four for free unless a few of the young kids take massive steps in their development throughout this season. My guess is he stays with the team for years to come. 4) The Leafs kept the goalie they want to out of the three, but their goaltending depth went from an organizational strength to a weakness in 24 hours. If Andersen misses any extended time, the Leafs should be very concerned. With that said, I’m not sure how Sparks will acquit himself as a spot starting backup and even still, they will want more goalie depth than the current outlook. Both Carolina and Philadelphia will have goalies returning that will likely put McElhinney and Pickard back on waivers, so it might be as simple as reclaiming one, but it’s hard to imagine the Leafs do absolutely nothing in net the entire season when their top three is Andersen – Sparks – Kaskisou. 5) While everyone focuses on the defense and now goaltending (rightfully so), I think the Leafs will have to look at adding a depth forward by the deadline. The mix is not great there right now and they will spend the first quarter of the season trying to find the right combinations to get good minutes out of young players in limited roles. I am guessing Babcock will want a steady vet on that fourth line – instead of three rookies – come playoff time.